Jane witnessed the abduction of her older sister Julie. Julie disappeared when she was thirteen years old and nobody was able to find out what happened to her. Jane's parents were devastated and even many years later they keep hoping they will some day see their daughter again. When one night a woman rings their doorbell they're stunned when she introduces herself as Julie. Are they really that lucky and where has Julie been all that time? Julie and Jane's mother Anna doesn't know how to handle the return of her daughter. She's ecstatic, but she's also worried. She hires a private detective who follows Julie to find out where she's going and what she's doing. Things aren't adding up and Anna has no idea why. Who is the woman who suddenly appeared on her doorstep and what is she going to do with the information she's getting from the detective? Has her biggest wish come true or is there something sinister going on? Good as Gone is a gripping story. I was hooked from the start and couldn't turn the pages quickly enough. I felt bad for Jane because she had to live with the guilt of not being able to rescue her sister while witnessing the abduction. My heart ached when I read about the scared little girl and the person she's become afterwards. Anna has made a lot of mistakes, but she's a smart woman. She doesn't just believe the woman who says she's Julie. I loved the way Amy Gentry portrays her and describes her niggling feelings of doubt. Julie is independent and she looks like she knows what she's doing, but what's being buried under that façade? I badly wanted to find out what happened to her and was pleasantly surprised by the ending of the book. I loved the way Amy Gentry describes the family and was captivated by their story from the start. Good as Gone is a quick and easy read that is both fascinating and intriguing. Amy Gentry's writing has a nice flow and her detailed descriptions make the story come to life very well. She's written the story from several different points of view, which makes it complete and extra interesting. Good as Gone has many emotional layers and I loved the questions that are being raised. Amy Gentry knows how to build up tension and that makes this story fantastic. I thoroughly enjoyed reading this book and think it's an excellent enthralling read. This sounds like a great read and it would make an awesome movie too. ...Genetic testing. Blood tests. DNA. Background checks. THE INTERNET. Hair follicles! I have no idea, but it seems like... For the remainder of the review here, I had to rely on some pretty strong suspension of disbelief. My hope would be that within the book itself, this would not be necessary. I peered at it for a good while before even getting to the actual review. I wondered, What else was considered in terms of options? Those colors; the tagline? ...In my opinion, it doesn't "fit" well with the contents of the book itself. The cover is quite simple and different from most books in the genre. Would you have preferred photos or red lettering or not just lettering at all? I'm curious now :). Fascinating! 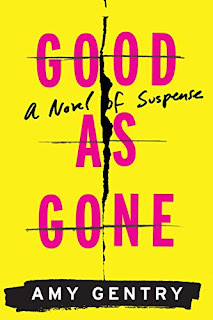 Good as Gone sounds like an intriguing read! Great and honest review. I'm not sure this is a book for me, but this review was intriguing. Thank you for the great review. I love mysteries, this sounds like something I would like. I will definitely check it out! I got goosebumps reading the snopsys. I desperately want to read it, thank you for your review. The book cover design is both simple yet striking. This is the kind of cover I like: quite stark, giving next to nothing away. Oh this book sounds really interesting! I'm already intrigued about the story and I want to know what happens, so I'll probably be reading it soon. Great review! Sounds like quite a page-turner! The title is ominous. Which is fitting for the blurb.